Distinguished guests, ladies and gentlemen it is a great honour for me to be here today to honour the memory of General Richard Mulcahy. As Minister with responsibility for Defence, I am acutely aware that I follow in the footsteps of a long list of people who are remembered for their patriotic service as Minister for Defence. Richard Mulcahy is unique amongst all these Ministers. 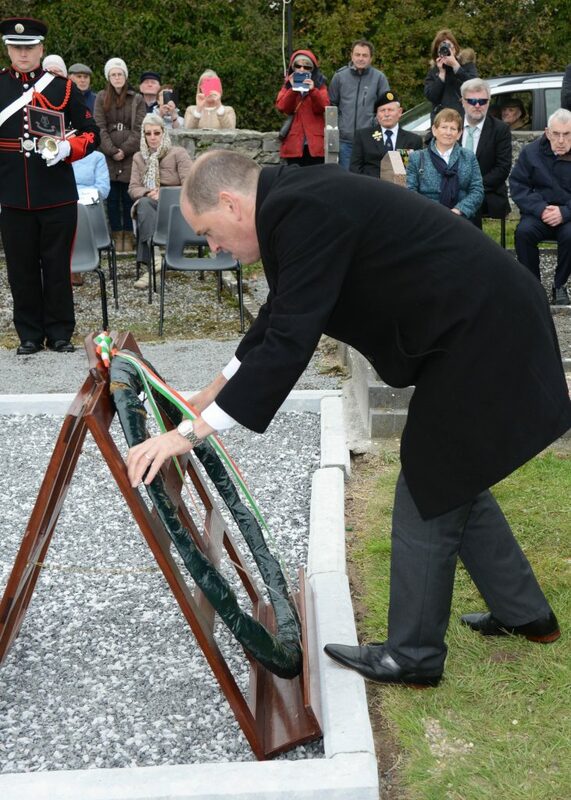 Not only was he the first Minister for Defence in the State, he also served for a time as Chief of Staff. This decade of centenaries gives us the opportunity to commemorate the events that led to the foundation of the State. Richard Mulcahy was at the centre of many of these events from 1913 to 1923. As a member of the Irish volunteers, he fought at Ashbourne, County Meath as second-in-command to Thomas Ashe. This is a battle that can often be overlooked in remembering the events of Easter week 1916 as the focus is usually on events in Dublin City centre. The events in Ashbourne are important as the tactics were those which are credited with setting the example for the style of fighting displayed in the War of Independence. It is no co-incidence that Richard Mulcahy had a central role in these events. This year marks the centrepiece of the decade of centenaries as we remember the events of the Easter Rising. Reflecting on the past and understanding the significance and complexity of the events of 1916, can help us to forge a future for Ireland that is worthy of the ideals of the volunteers who fought and died during Easter week. 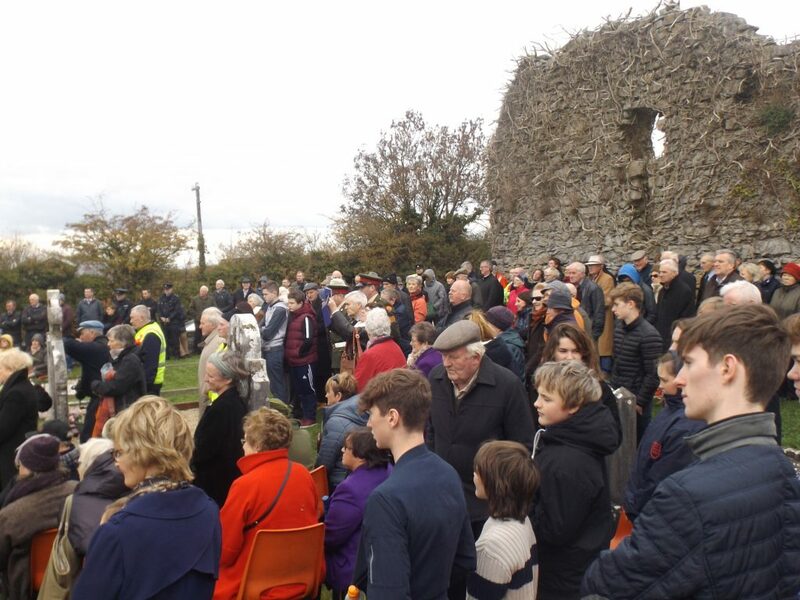 There have been many events this year organised at local and national level which have commemorated and recognised the contribution of those who took part in the events during Easter 1916. The Defence Forces have played a very central and important role in the Commemoration events that took place all over the country. In collaboration with the wider civil and public service, my Department, the Department of Defence, and the Defence Forces have worked together to ensure the successful delivery of events such as the commemorations of the rising, the commemorations of the executions of the leaders of the Rising, the Arbour Hill centenary ceremony and the opening of the new Military Archives facility in Cathal Brugha Barracks. The work the Defence Forces undertook through the Flags for Schools and Proclamation programme received very positive feedback from teachers, parents and school children. This initiative has helped to teach an entire generation of school children about a particularly important part of our history and the significance of our National Flag and the Proclamation. I am very proud of the work the Defence Forces did this year to commemorate the centenary of the 1916 Rising. I am always proud of the work the Defence Forces do on a daily basis both home and overseas. I would like to think that if General Richard Mulcahy was here with us today, he would be proud of the Defence Forces which he helped to establish. 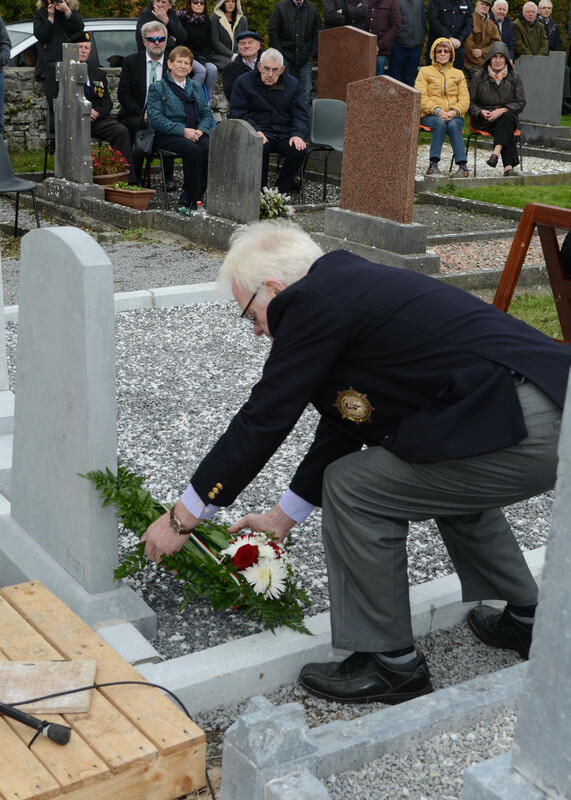 While the events of 1916 to 1923 are a landmark in the foundation of this State, Richard Mulcahy’s contribution to this emerging State did not cease there. He was elected to the first Dáil in 1918, where he was appointed as Minister for Defence. 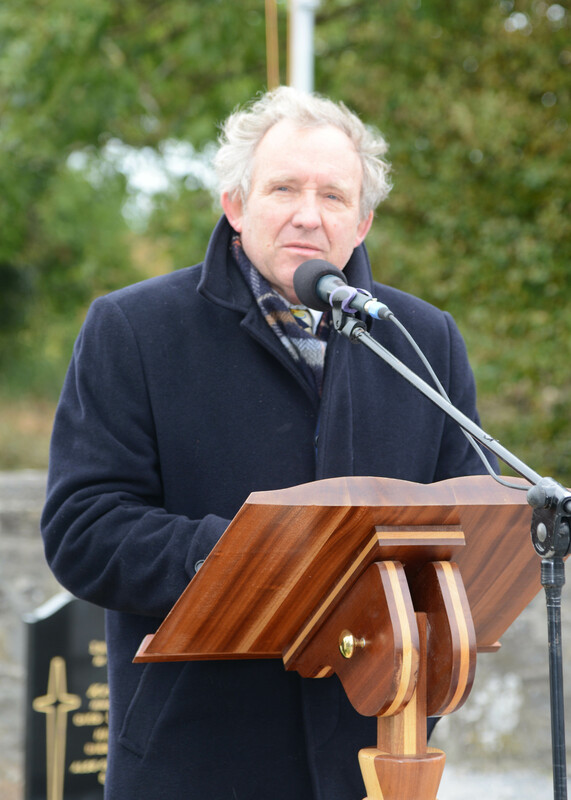 During the next 40 years in his political life he also served as Minister for Local Government and Public Health, as Minister for the Gaeltacht and as Minister for Education. Richard Mulcahy’s selfless devotion to his country contributed to the establishment of the first inter-party government in 1948. Although he was leader of Fine Gael at that time, he took an extremely honorable decision to stand aside and allowed John A. Costello to form a new Government. Foregoing the opportunity to serve as Taoiseach could not have been an easy decision but it was a mark of the character and patriotism of the man. Today, we join with Richard Mulcahy’s family in this act of remembrance, commemoration and celebration of a life lived in the creation of the Ireland we have today. That is why it is important to have events and memorials like today where memories and our shared history can be passed from one generation to the next. I hope today that you gain an insight into the life and achievements of the great man Richard Mulcahy. Richard Mulcahy Grandson of General Richard Mulcahy. Richard Mulcahy, along with Michael Collins, was the most wanted man in the British Commonwealth in 1920 with a reward of £10,000 on each of their heads. It said a lot about the Irish people that they were not prepared to turn in one of their own for what in today’s terms would have been worth over €4,000,000. Since the first election in Ireland 98 years ago Richard Mulcahy still holds the record for the highest number of 1st preference votes with 22,205 votes. This speaks a lot about a man who was embroiled in controversy from the first time he introduced guerrilla warfare tactics at the battle of Ashbourne in 1916, through the War of Independence , the Civil War and beyond. The reason we believe that he has been ignored or forgotten is that he was a modest man, and avoided the limelight as much as possible. From the time that Richard Mulcahy returned from gaol in Frangoch in December 1916 he took over the training of the Volunteers, then becoming first Chief of Staff of the army in March 1918 and Commander in Chief on the 22nd August 1922 when Michael Collins met his untimely death, he skillfully set up and guided the newly founded Irish Army into what is today the most professional, loyal and committed arm of the State and serves the Irish people like no other organisation. In 1944 when Fine Gael was in the doldrums Richard Mulcahy became leader of the party, and over the coming four years worked tirelessly to build the party back up. In 1948 he selflessly stepped aside as potential Taoiseach to allow the first inter party Government to be formed. I am delighted that we are here today to honour a man whose only interest through his career was to serve the Irish people (not just those in his own political party but every Irish man and woman). He loved Ireland, he loved the Irish language. The extended family are delighted that finally Richard Mulcahy is getting some of the recognition that he duly deserves as one of the founders of the State, and hopefully one day he will be given his rightful place in the history books that he has earned for his major role as a military and political leader. On behalf of all the 2nd, 3rd and 4th generation Mulcahy clan I would like to thank Deputy Paul Kehoe, Sean Kelly MEP, Noel Coonan, Chairman of the Collins 22 Society, Fr. Bourke, the Ballymoreen Graveyard Working Group Past & Present, the Moycarkey/Borris Pipe Band members and of course the army bugler who we are about to hear for their kind words, music and organizing such a wonderful event. In particular I would like to thank everyone who has traveled from near and far to celebrate our grandfather’s life. 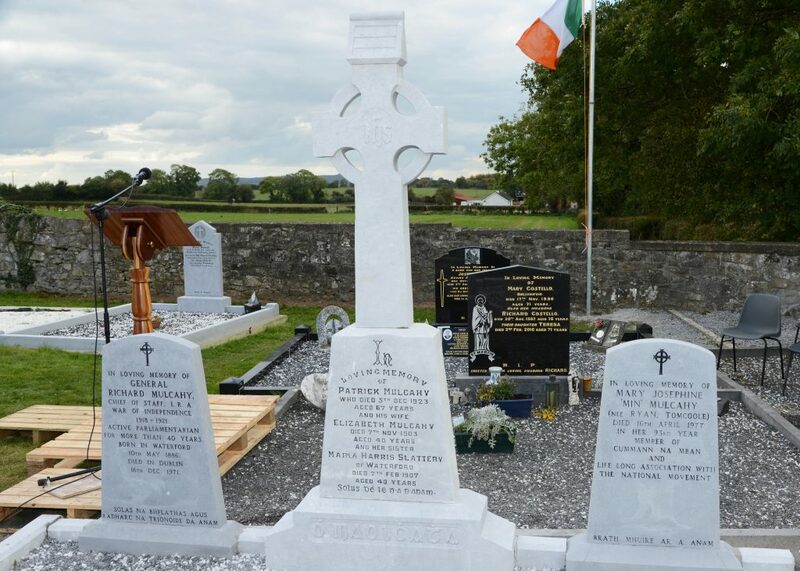 And to those family members who have passed on to the next life – Padraig, Maire, Nellie and Risteard – you would have been proud of this day for your Dad. To Min Ryan who was married to Richard Mulcahy – we should acknowledge how she was the backbone of the family and held it together through many turbulent times. To Elizabeth and Sean – may you have the pleasure of finally seeing your Dad get the recognition that is due to him. Go raibh maith agaibh go léir as an lá seo iontach chun ómós Risteard O’Maolcatha agus tá súil againn go mbeidh an sásamh bualadh arís. 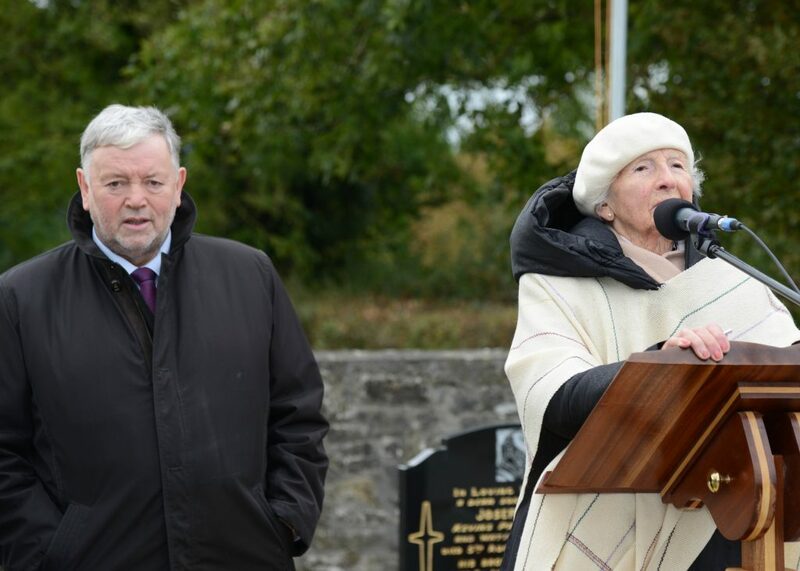 “Master of Ceremonies” Noel Coonan President of the Collins 22 Society with Elizabeth Mulcahy daughter of General Richard Mulcahy when she acknowledged the work of the Graveyard committee and the Organising Committee for the Commemoration of her Dad in Ballymoreen Cemetery. 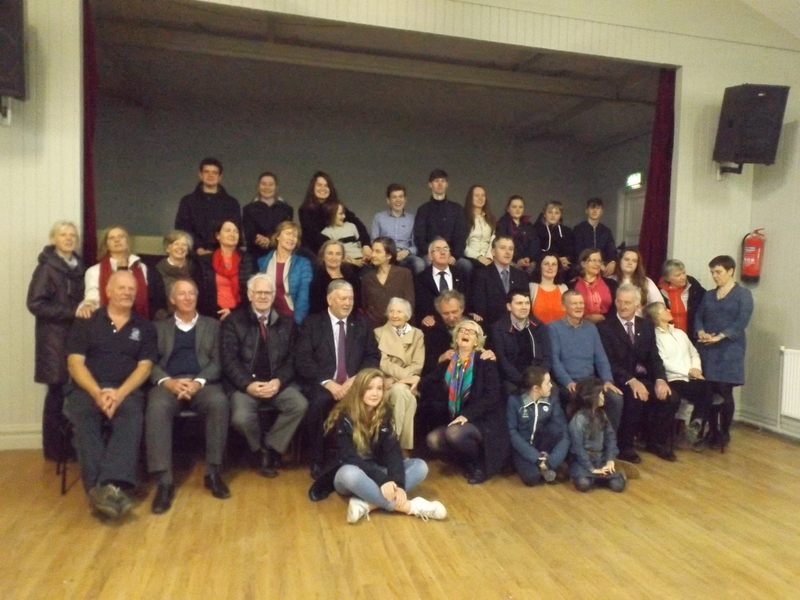 A group photo including the extended Mulcahy Family with the Local Organising Committee. I had the pleasure to get to know Sean and Rosemary Mulcahy when Rosemary taught a semester course at my college several years ago. Beautiful and creative people. I have one of Sean’s art pieces on my office wall. All the best to you, and God bless you all. Yes Lisa, Sean and his wife Rosemary both very gentle, caring and creative people. Sadly Rosemary died suddenly over a year ago. Sean’s love of colour no doubt is evident on your wall , I hope it lifts the duller days outside.